"Groped by an Angel" was the eleventh episode of the fourth season of the Daria TV series (episode number 411). It first aired on MTV on July 19, 2000. "Groped by an Angel" was written by Jonathan Greenberg. After watching a television show proclaiming the existence of guardian angels, Quinn finds religion, kinda-sort, and believes that guardian angels are monitoring even the minor details of her life. 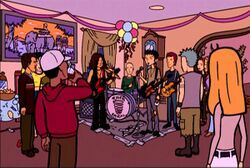 Daria is, of course, skeptical (and annoyed), but that's not the least of her problems: Jane is pressuring her to go to a party that's being held in Brittany's honor to celebrate her "C-" average (a party at which Mystik Spiral is performing). Jane finally convinces her to go by reminding her that Quinn would be mortified if they went. Quinn's new-found spirituality is reinforced when she narrowly avoids being hit by a falling light fixture that Jake is attempting to install, claiming that her guardian angel saved her. Stacy and Tiffany are also convinced, as are the Three Js, but Sandi doesn't buy it. However, there's no stopping Quinn, especially after the rest of the Fashion Club becomes ill after eating salad with bad dressing from the school cafeteria. Daria becomes increasingly irritated by what she sees as her sister's faux spirituality and obvious gullibility, an attitude that starts to irritate an exasperated Helen, who sees nothing wrong with what she sees as an essentially harmless belief. Jane tells Daria that the real reason she's bothered is because she's worried that it's true: there are higher powers looking out for people like Quinn and that's why they fit in so well, and everything is rigged against people like them. We don't know if Daria is actually worried about this but Jane seems to be, since she's left depressed after saying it. The website Reburb tells us that performing at Brittany's "really ruined their [Spiral's] credibility for a while. There were pigs in a blanket, though, so it wasn't a total washout." Helen claims she's spiritual, despite her extremely amoral job. Steve Taylor "borrows" money from his son's college fund to pay for gifts for Brittany. Mr O'Neill goes to Brittany's birthday party. That's quite weird. Stacy implies she once peed herself in public, saying an "accident" is "so humiliating you just want to die! ...um, I imagine." Fanfics this inspired, partly or in whole, include "Guardian" by Mike Yamiolkoski, "An Angel Named Mary Sue" by Angelinhel, and party of "Illusions" by TAG. "Groped by an Angel" Summary in Outpost Daria (via Wayback Machine). This page was last edited on 21 June 2013, at 17:51.